Rush hour in the platteland – look out for passing meerkats. The perfect small South African town? At the outset, let me say, you and I are looking for something that doesn’t exist. There is no perfect town anywhere in the world. In this instance, we have to settle for ‘as good as possible’ and leave it at that. My wife Jules and I had been searching for our rural El Dorado for nigh on 15 years. We found enough out there to convince us to leave our Wendywood, Johannesburg, home 12 years ago and settle in the little river town of Cradock in the Eastern Cape Karoo. 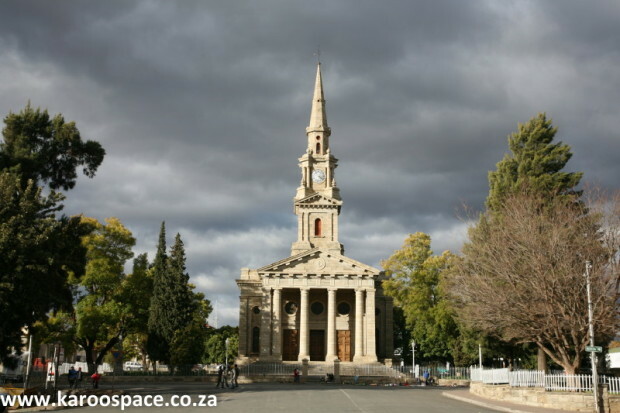 The Mother Church in the authors’ home town of Cradock. “Why Cradock?” we always get asked. “It’s complicated,” we reply these days. Like anywhere else, there’s stuff to whinge about here. But when we’ve been working in, say, Cape Town for a week or so we begin to hunger for the wide, friendly streets of Cradock and the open skies of the Karoo Heartland. Did you know that you can make a U-turn with a 16-ox wagon in Cradock’s Frere Street? Just try that little trick in Kalk Bay. Let me share some insights about small town living that might help you decide to put up that For Sale sign on your suburban life. Well, where we live the broadband connectivity is good. But we do have a power failure back-up plan which involves (in winter) a roaring fire, a lustily played Spanish guitar, lots of blazing candles, cheese, crackers and bottles of red wine. This plan is often put into action, and when the lights come on we simply switch them off again and carry on warbling. But generally we can talk to the world and our clients via the Internet, which makes it possible for us to live here. There’s always a chance of a finding your perfect home somewhere in the country. Rentals are lower, local hire doesn’t put your overheads through the roof and, in general, the cost of living drops radically – along with your insurance rates. But just remember: the freshest vegetables are always sold in the cities. That weird truth is right up there with why the braai smoke always follows you around at a party. With the right job in the right country town, you can call the shots – and the hours. Want to wake up at 4am and be productive? Sure. Want to take the day off and ponder? Why not? After all those years of 9 to 5, you’re in charge. It’s a heady feeling. But don’t chill out too much, or the cheques will dry up. Casual Friday comes every day. In winter, most of us in Cradock hang out in Michelin Man jackets and tracksuits. Summers are all about shorts and T-shirts. Nature and the great outdoors are minutes away from home. On weekends, children are packed into the family car and taken off on adventures. And when the snows come, everyone’s out there building Frosty. In summer, kids come floating by the sports fields in massive tractor tyre tubes on the Great Fish River, chortling as they pass. But the question still persists: So where’s the perfect town? We also moved from a city to a small plattelands dorp and I don’t have any regrets and don’t like going back to the city now. It was a huge adjustment as we built our own house without any labour, we didn’t know anyone and the main language is Afrikaans. I joined the Farmers Association, the VLVK, have started a camera club and last week started exercise classes in the town. The people here are really salt of the earth and are wonderful, friendly and very hospitable. I would love to escape the city – I just need a job on the platteland. Currently working as an assistant project manager at an electrical company and previously manager at a filling station. If anyone can assist please help. Lovely writing, thank you. Funnily enough your power failure backup system sounds a lot like ours in Observatory, Johannesburg; although we can’t add the tuneful warbling ;-). Two years ago we came to Oudtshoorn for a weekend and bought a house. People thought we were nuts to leave the city (PE) and still ask us what made us move. Honestly… we just don’t know why?! Hubby left a very good high paying job and we moved to the Karoo for the hell of it… and would not change it for the world! Semigration is the best (if not only) option! Forget the city… forget the stress… forget the traffic and filth! We have settled in very well and even opened up a shop in town (gemstones, crystals, beads and jewellery). The business took off so well that we had to relocate to bigger premises and we are still growing – something that simply would not have been achieved in PE. Almost instantly we felt “at home” in our new town. Friendly neighbours, etc – even total strangers still greet us with a smile! Everything is so neat and clean, and nothing is further than 3km from our house – shops, banks, garages, etc. Drive 60 minutes in any direction and you are surrounded by natural beauty. Granted if you need certain “bigger things” that are only available in the city we have to go over the mountain to George, but you learn to live without the luxuries that we were accustomed to in the city (ie. Makro, Game, stores open on Sunday’s, etc) – you learn to appreciate family time together instead of stressing through traffic and fighting crowds in the malls. The only question remaining is “why did we not make the move sooner?”! It is a “huge” jump over the hedge to leave your comfort zone of being “another” sausage in the sausage factory. The funny thing is, there is an enormous sense of purpose when one pioneers new energy into a small rural town. One definitely does not leave the rat race and move to a small rural town for the money, but the sense of being when you pause to breathe or ponder the view or just listen to the silence, is priceless. One’s perpective on life definitely changes and the fact that your prescription from the local doctor is delivered by your pharmacy before you get back home and you are trusted to go and pay for it the next day, somehow restores faith in humanity. Here, you are somebody, albeit, eccentric! What a co-incidence Chris. Melissa, my wife, and I left Wendywood 8 years ago and moved to Cathcart, which is very close to you. Loving life and not missing JHB. We lived in Luderitz St. off Bowling Ave.
Hello neighbours! Isn’t the Eastern Cape wonderful? We left city life to live in Aliwal North and life here has been incredibly happy. The doctor, pharmacist, etc all know us on first name terms, even though we are rather reclusive people.We have developed more friendships here in the 2 years than all our years in the city. No threat of serious crime too. (We leave our doors open alot of the time) When i heard we are leaving Aliwal, i cried for 3 weeks, but I’ve heard that the folk in Graaff Reinet are great too, so a new adventure awaits us there! Oh yes, Hillary. You will be happy here. It is a lovely town. I moved here with my husband over 10 years ago, never regretted it. Sadly my husband only had 3 years here before he passed away but even here on my own I have a quiet but happy life. Wishing you a happy life here. We found our place of bliss in Lady Grey. It lies in the foothills of the western Escarpment but really has a Karoo climate and vegetation. The best of two worlds. I have a photo album on my Facebook page called “Lovely Lady Grey”, if you are interested. Enjoy! And thanks to ESKOM, we enjoy dinners by candle light again.Drop in for a cuppa, when you come to our neck of the woods. I know you from my 20 years with SATOUR. Great photographer! I’m seriously considering a move to Robertson in the Western Cape. I’ve already given notice at my job.. guess I finally decided that a comfortable salary isn’t worth the chance of having happiness. I’ve been looking for a someone to tell me that I made the wrong move, but so far, I’ve been unsuccessful. I look forward to a life of simplicity, beautiful scenery, and relaxed working hours. Give me six months, maybe I will return to post another reply… I would like to know if there are any tips you wish you had when you first moved to small town SA. My wife and I own a house in Bluewater Bay, P.E. with sea view, and would like to also relocate to the Karoo (Swellendam/Robertson) and would like to “Swap our House Valued at +_ R800K to R850K for Karoo living in either of those towns or Bredarsdorp. in case anyone, knows of someone, maybe transfered to P.E. My beautiful neat facebrick house is for sale in Cradock if anyone is interested email me and I’ll send foto’s. Montagu is our new home town. We left the city (Cape Town) after living there all our lives. _ (58 and 60 years) This move is such an adventure and so enjoyable! We agree with much of what you wrote in your article! Montagu residents are so friendly and helpful across the board. People greet all the time. We walk or cycle where we need to go, only driving when the load id too great to carry. Outdoor life is 5min from our home in the town. We would recommend this way of life. Wonderful reading all the comments of everyone who has take the plunge, especially many little places that we have experienced over the past 10 years. The Karoo has always had a very special and magical place in our hearts so the choice that we are faced with is huge. Places like Lady Grey, Cradock, Graaf Renet, Union Dale, Oudshoorn, Calitzdort, Price Albert and a few more….. In the end we have chosen to relocate to Montagu, a truly wonderful, and very beautiful historical village which is part of the Breede River Winelands area with Ashton, Bonnivale, Mcgregor and Robertson. 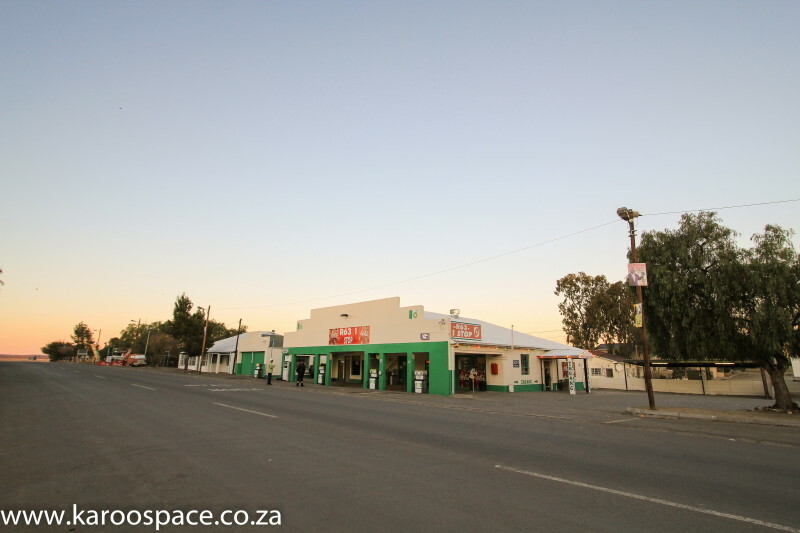 The very first pic in the article is of Williston which is the town I chose two years ago having moved from the E Cape. I echo the statement that the people of these rural towns are the most warm-hearted and welcoming beings in SA. It gives back the meaning of the phrase “friendly South Africa.” The bliss of sitting in the silence 1 Km out of town and watching a beautiful Karoo sunset cannot be surpassed by any other form of soul feeding tranquility. Country Life Magazine, Chris Marais, Julienne Du Toit and their Karoo Keepsakes books are to blame. Cindy and I have lived in Durban all our lives and have just done our second trip to the Karoo and we are hooked. She loves Montagu and I could live under a windpump somewhere near Prince Albert. What a place. We have just signed to sell our house in Waterfall and are going to head that way. We are very nervous but have decided that it is now or never. If things don’t go right we can always jump off the top of the Swartberg Pass. A marine radio tech from Durban harbour is going to be looking for boats in the Karoo……..
Hi Ian, You and your Cindy are just the kind of people we like to write for. Happy trails and happy landings, wherever you may roam, wherever you may fetch up. Chris and Jules. I am also Durbanite, born and bred, however I am wary of Durban’s future especially under the control of the ANC and what with 10,000 migrants arriving every month….trouble ahead. So I started looking for a small town that met these criteria. I love Swellendam and the surrounding areas. We currently stay in Cape Town and are thinking of moving to a smaller town, would you still recommend Swellendam in early 2018? We have a lovely old house for sale in Colesberg (circa 1850), needing TLC to restore it to its former glory – it used to be one of the grandest houses in the town! Large rooms, high ceilings and character. Could be developed as a guest house. Hi my name is Lorraine I would love to live in a small town in the Eastern / Western / Northern Cape areas but how do I go about getting a job I have looked on the job sites just cannot find something? I seriously want to move to a small town if anyone can help me please! Lorraine, keep watching http://www.karoospace.co.za. We have a development planned there that may help you. Thank you very much for your reply Julienne will keep on watching. We are also quite desperate to apply and will be keeping a close eye too. Thanks so much Julienne. Just what I wanted to know. 47years inn JNB and 28 in a Corporate positions civil aviation I needed a change. I startted cheffing at a lodge in NW and then moved to a restaurant in the Central Drakensberg. Extensive travel through the Karoo tells me where my heart lies. I’ll be sure to keep looking out for positions in the Karoo! Hi all potential and existing Karroosters, we made the move 8 years ago and have no regrets. Sure there are inconveniences but none that outweighs the joys of living here. Here being the wonderful village of Bedford. People are wonderful and there is a real sense of community and you can be as busy or chilled, whichever you choose. Before you decide Check our webpage!!!!! You’re all driving me crazy! Every time I travel through the Karoo my whole being screams to stay for a while…or is it forever. As a divorced male I have visions of isolation after the first three months. I still need to earn a living too and I don’t think the small towns can sustain me. Not that I need lots of money. Decisions, decisions. Most of these comments ring true… We’ve been in an out of the Karoo for three years now usually on fairly impromptu “visits” and after each excursion a part of us remains behind. Finally we found our little place in the sun! We’ll be moving in the next few months. Our house is in the market and we’ve started packing… Now we’re alternating between absolute elation and terror. Anyone with tips on relocating? Thanks for the comment, Michael. Welcome to the Karoo! Keep in touch with Karoo Space and let us know how you settle in. Lovely type of writing. Most of all I agree with this sentence “There is no perfect town anywhere in the world”, but if you must relocate to another town, you have to settle for ‘as good as possible’ and leave it at that. I have lost my job in Johannesburg. I need to move to a city that will be able to help me start a new life with very little money. are there any suggestions please? I really wish I could make the move all of you have made. Our lives would be transformed instantly. The beauty of our country is breathtaking only if we take the time to notice it. I believe living outside the city shows us this. I snorted when people said they moved from the city – PE, Durban, Cape Town, to a smaller town. Being a Joburger, all of the ‘cities’ mentioned feels more like small, slowed-down towns. Cannot imagine how blissful even smaller towns must be. I would love to move to somewhere like Arniston. Someday. Six weeks ago I relocated from the Western Cape to St. Francis Bay to be nearer to my 87 year-old father who lives in Port Elizabeth. The company made me an employment offer I could not refuse. Unfortunately on arrival in St. Francis Bay (without a contract – only e.mail promises which I believed would be honoured) I find I am unable to even afford my rent and have now become a burden to my Father. I am a mature, (55) single, hard-working, loyal and honest person. Who is now looking to move to a small town, run a lodge or guest house (I have excellent references) and if anyone could assist me I would appreciate it. Hi, love reading your replies. My heart longs to live in a small town, living in Johannesburg for so long has certainly taken its toll on me. How do i go about searching for the ideal place and job? I am a sole bread winner and have a 6 year old boy; his dad is a carpenter. Oh how wonderful this all sounds. Won’t.it be great if there was an agency that could help city dwellers to relocate and find jobs? I for one will use them. 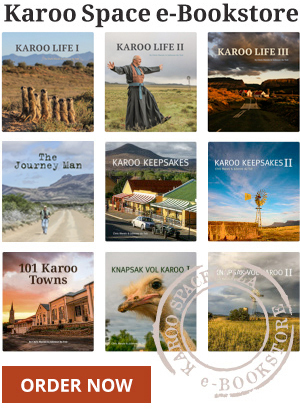 What started as a lovely place to share the experiences of the Karoo has developed into a whining blog for people looking for jobs and property. We have come to the Karoo to get away from the incessant griping. We picked ourselves up and set off like the old frontiers, took a chance and are making the most of it. Never asked for help or a job – we came out here and looked for it because this is where we want to be. There are many sites that sell Property and offer jobs, not this one. Here we chat and enjoy the peace of the Karoo. Hi there I am a pensioner living in Florida Road Durban which is surely one of the noisiest and loudest streets over weekends. Oh how I long for the peace and quiet of a small town. Living on a government pension is not for sissies but I am, at the age of 64, still healthy enough to do any type of work. Is there anyone out there who is fortunate to live in one of the smaller beautiful quiet sanctuaries that could assist with accommodation in return for a dedicated, fit, honest and hard working computer skilled older male. I am very keen to improve on my artistic talents so would love a town where artists congregate and learn from one another. A tall order I know but hey even at my age, no one can take away my dreams. Hi All. Me and wifey ditto all the comments. We have decided to relocate to a small town. After numerous searches and drives we ended up with 2 possibilities. We love others but they’ve become way too expensive (Property) – Montagu, Swellendam, Kleinmond.). The 2 places we find most reasonable are Porterville and Ashton. Both are very scenic and are looked after by some of the best municipalities (Bergriver and Langeberg). Any information or insights will be appreciated. Thank you!! I have decided to drive back to Joburg after a holiday in Cape Town so I can do what I have always said I wanted to do and that is take my time through the Karoo. I can’t wait to explore the little towns along the way! Do you think it will be a risk to not book accommodation along the way? It will be in early January 2017. Hi Lyndsey. It would definitely be a risk not to book ahead as December and January are the busiest months! Many guesthouses & hotels end up being fully booked within this time period…. 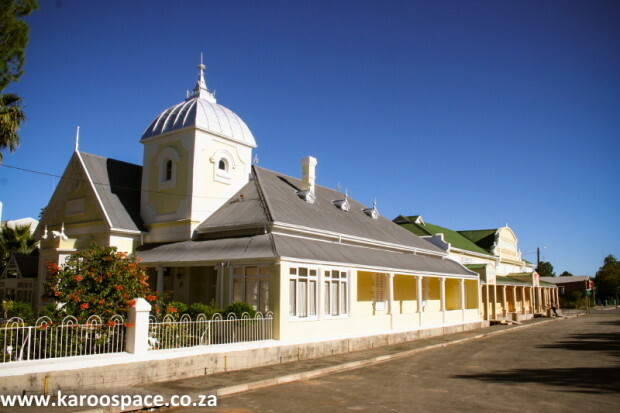 Hi Beverley – Thanks for the lovely note on Tarkastad – and our home town of Cradock! We look forward to welcoming you back to the neighbourhood. Regards, Chris and Jules. We always said one day when we retire we will settle in a small town…Well, for a year we searched, compared and searched some more. We eventually ended up in Ashton, a small town between Robertson, Montagu and Swellendam. Now we wake up to a glorious view of the Langeberg mountains, abundant birdlife and the sun peeping into our bedroom…and life is BEAUTIFUL…. I am an energetic, fit divorced opwm (older pale white male). I am looking for a later life career in a small town preferably in the Western Cape, but that is not essential. My background includes having run as MD or CEO many large and small businesses. I am an accomplished cook, photographer and gardener – love the outdoors. Being a bit of a chameleon, I am able to easily adapt to change. Love to be in the company of like-minded people and would treasure a life in a smaller town. As long as I have a warm bed, a stove to produce a wholesome meal and the stars at night I don’t need too much else. I have my own online business which i run from home, so I would need a good wifi connection/ ADSL line & electricity most of the time (I do have an inverter for those times with no power). To start with, I would want to rent a 2 bedroom house/ cottage & would appreciate any feedback on what one can expect to pay for rentals in these areas. Any general tips/ suggestions would be welcome. I am currently working in Kenya and my family is in Gangsters Paradise (Gauteng, Pretoria). I need to find out from your Cradockers how crime is affecting your beautiful town. I want to move my family from Pretoria to your beautiful Cradock while continue to work out of SA. I’m a pharmacist. I’ve got experience in many fields in this profession, and I long to give my honest all, to my fellow beings. I grew up on a farm. All I ever wanted was to serve and empower my family, friends, neighbours, colleagues, patients, even strangers. We, as part of the human race have lost the ability to care and to give. All I want to do is pass on my knowledge, caring and healing. If there is any platteland town out there that needs someone like me to truly see you, hear you, feel you and acknowledge you, please submit a comment. Since the age of 13, when we left the farm, all I have longed for is to see the horizon again, clearly see the stars and give meaning to others’ lives – where my life will then also have more meaning. I cannot accept this rat race anymore. Our book Moving to the Platteland is now available as an ebook. (Here’s the link to order it: http://karoospace.co.za/ebooks/product/moving-to-the-platteland/). From early July 2018 we will have the print book available too! Let us know if you’re interested, and we can post you a signed, first edition for R200 (special offer until end of July 2018). Leave a Reply to Brad Lee Click here to cancel reply.